When I tell friends and acquaintances that I am a member of the Hash House Harriers they seem to think that it is something to do with taking drugs. Actually this is a group of expats and Russians who meet every Sunday to go for a run in different parks throughout the city. No matter if the temperature drops below -20C degrees, if there is heavy rain or searing heat, there will always be someone there. This is not simply a running group but people who go to socialize, to walk, to see new parts of Moscow and there are those that like to go for the beer and songs. This is a truly international organization with 1892 groups in 1229 cities in 182 countries from Alaska to Antarctica. Often groups organize events such as skiing trips, cruises, and anniversaries where members from other cities are invited. Every two years, an interhash is organized where all members are invited to come together to celebrate and run. The last one was in 2008 in Perth, Australia with 4500 attendees and the next one will be in 2010 in Kuching, Borneo. The idea was originally formed in the 1930s, in Kuala Lumpur, Malaysia by a group of British colonial officers who needed to run off the excesses of the weekend. “Hash” comes from the name they adopted from their colonial club, The Royal Selangor Club, which was called the “Hash House” because the food was very much like an English dish made from leftovers or hash stew. The Harriers are a pack of runners who chase after a member, or members of the group called hares. It is an idea that originated from a game called Paper Chase or Hare and Hounds during the early Victorian times in Britain where pieces of paper that were supposed to represent the scent were left behind by the hare. Others would try to follow this trail and catch the hare before the end of the run. More recently the hares have put marks on the ground in flour so that the harriers can follow a path though the park and these may be arrows, dots, circles or crosses. Finding the correct route from all these diff erent marks is part of the fun and often involves people getting completely lost. Alternatives to flour are used in the winter such as colored water, chilli powder or ribbons. There are stops during the run for games, singing, talking and drinking, depending on the fitness of the group and how sociable they are. At the end of the run members are rewarded with beer or other drinks, and food. In Moscow the runs are usually set within the MKAD and we will often go to Kolomenskoye, Sokolniki, Sparrow Hills or Izmaylovsky Park. 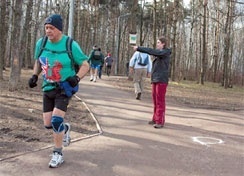 This week the people who are setting the run, our hares, were at a park near Altufyevo. If you have been a few times then it is usually customary to stop using your real name and give youself a Hash name. Our hares are called Rooted and Burning Lust and joining them for the run were, among others Biggles, Bono, Yo Boy, 007, Wrong Exit and Snap off. There was only a small group of 12 on the run described here and there was none of the usual singers and people who like to play games so this time we were bereft of certain frivolities. 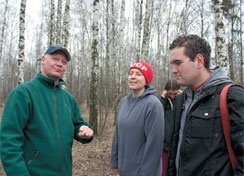 The newcomers were welcomed and the marks explained to them and we set off into the woods. On that occasion we had what is known as a “live hare” which means that Burning Lust had set off 15 minutes earlier to put the fl our marks on the trail. If you were looking at this as a Russian walking his dog in the park you would probably be wondering what on Earth is going on, what all these people are doing wandering around in a park looking for flour and shouting “onon”, “are you?”, “false trail” and “check it out”. Well it makes perfect sense if you have done it a few times. About halfway round there was a chance to catch up with the hare, meet the walkers or just to recuperate some energy. The rest of the run was a little more, well, eventful. The trail went across a small stream and those with long legs jumped over while others found an easier route. 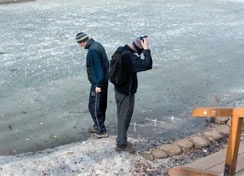 One of the false trails led some members onto a frozen lake which then led to everyone getting lost again. Passing though a child’s play park some people couldn’t resist using the slides and monkey bars. Eventually we arrived at a local bar and after lots of running we were rewarded with drinks and food. The run is usually between 5 to 8 kilometers but there is a more leisurely walking option. It doesn’t matter if you are a serious runner or just want to walk in the park. All are welcome – even children. There are lots of other social events organized by members of this group and it works closely with the children’s charity, Kitezh. It costs 150 rubles each time but this money goes towards a drink at the end of the run and your second time is free. We meet every Sunday at 3pm outside the Tchaikovsky Concert Hall near Mayakovskaya or if you join the group e-mail you can fi nd where the run is week by week. Information about worldwide hashing can be found at www.gthhh.com and there is more of the history of the Hash House Harriers on Wikipedia.